Yep, Kisa and I will be at Memories of Time all day on Saturday celebrating National Card Making day! We'll be doing two classes! 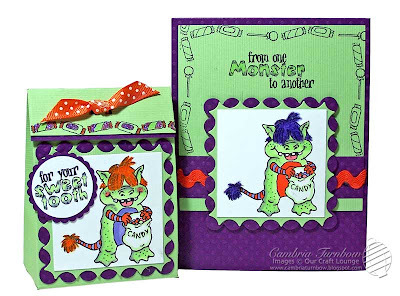 The first class, we are using the super fun limited edition Candy Monster stamp set which includes four Copic markers. 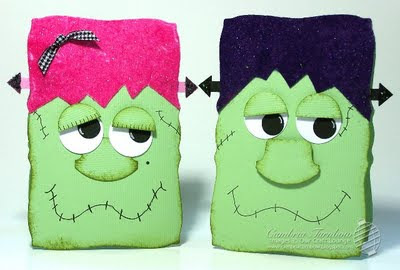 We'll be making a card and a treat box similar to these. I believe there are a few spaces left, so hurry and get down there to sign up if you want to participate. Once these fun sets are gone, they are gone. 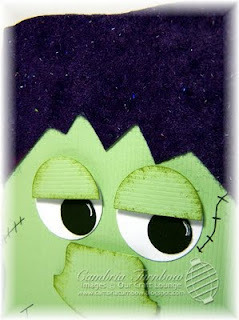 Cards are made using the Curved Rectangles from Spellbinders. I used the next smallest size down for a layer on the inside and to stamp the sentiment on. 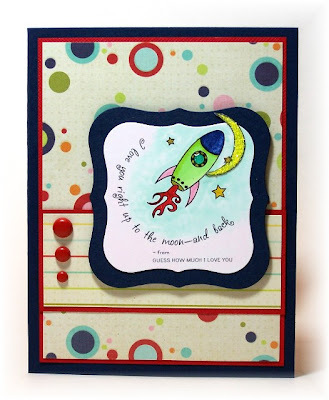 Hope you are celebrating National Card Making day and creating something fun! If you are in our area, Kisa and I would LOVE to see you! Big sale that day too! You don't want to miss it! Wow, 99 really? That is amazing! Hope you can play along over the weekend. 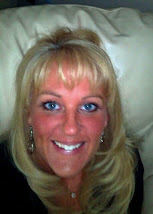 Check out Beate's blog for all the details. I'm happy to be back this week. I don't feel "right" when the weekend doesn't start off with a sketch and I missed the last two! So, whooo hooo for Friday and whooo hooo for the weekend sketch! Can you tell I'm using what's on my desk? Well, if you saw my desk, you'd understand. But, I just got back from Scrapfest and I still have my Candy Monster Copic markers out... so I decided to switch it up a bit and use the coordinating set called Sweet Tooth Terrors. Love this little monster hoarding the candy! I covered all those candies with Crafty Sparkles. His horn and ears (are those ears? wings?flaps?) with Punk Purple Sparkly Fluff. I applied both with my all time favorite Quickie Glue Pen. That cool ribbon I got at my LSS Memories of Time. I'm not sure who made it, but I'll find out next time I go... I just loved it so I grabbed some. 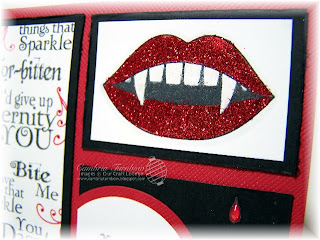 The designer paper is from Bo Bunny and the cardstock Bazzill. His cute eyes are raised and glazed with a dab of Glossy Accents. Check out the rest of the sketch team... I can't wait to see what they did. I totally had withdrawals over the last two weeks! Have a wonderful weekend everyone! Thanks for stopping by! WHOOO HOOOO! 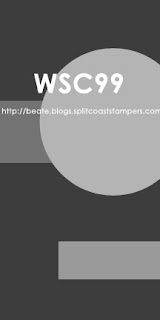 We are back from Scrapfest! WHAT AN AMAZING experience! Archivers is SO awesome. The staff is phenomenal! We had the best time meeting stampers and scrappers and making fun things! I just can't tell you how much exhausting fun it was! PS.... I want to thank all our wonderful friends who stayed up late with us and helped stuff bags, cut ribbon, stuff Sparkly Fluff, and help at our booth. And, my sweet friends who helped prep before we arrived! We LOVE YOU! Tomorrow is our monthly class down at Memories of Time here in Coos Bay. This is just one of the cute projects we are making. Kisa also designed an adorable treat box... want to see it? Click here. We'll have the tutorial on the OCL blog on Saturday. SUPER easy! If you need fast easy treat boxes to leave on desks at work or for the kids to take, this is it! If you are in the area, we'd love to have you in class. It's the highlight of my month.. we always have SO much fun. 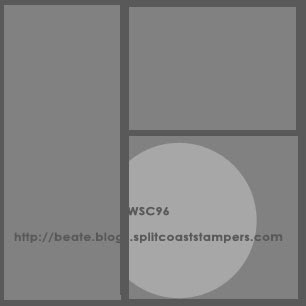 Paper: Limeaide Bazzill, Black Bazzill, Neenah White, Bo Bunny Desinger Paper. 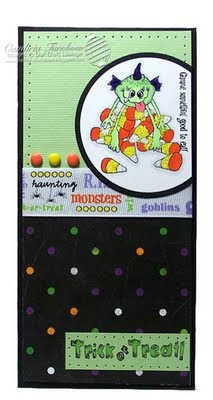 Other: Rectangle Nesties, Ribbon, Black Eyeliner Sparkly Fluff, Quickie Glue Pen, Glossy Accents, Jody's Foam Dots, Zip Dry, Scor-Pal, Corner Chomper. This card is super scary touch-able! 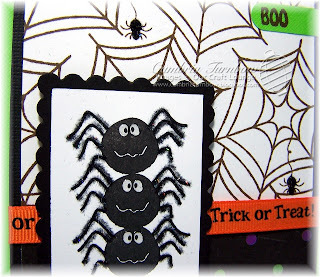 The spider's legs and the bodies of the little spiders are covered with Black Eyeliner Sparkly Fluff. Just write where you want your ink (with your Quickie Glue Pen), then dump it on, tap off. SPOOKY! I also covered the eyes with Glossy Accents to make them stand out. 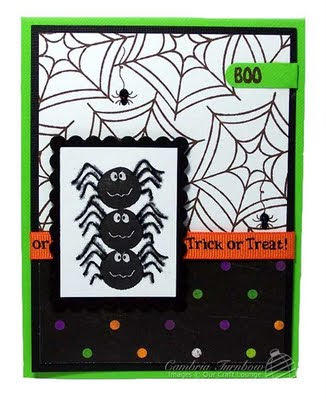 The spider web background is a stamp included in the set Spook-tacular. 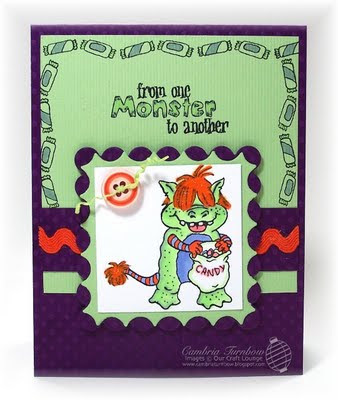 Halloween cards and treats are SO much fun to make! I just need more hours in the day! Taylored Expressions Birthday Bash Baby! Whooo Hooo! Happy Birthday Taylored Expressions! Check out what's fresh from the oven over at Taylored Expressions! Don't forget the blog, Sweet Impressions for all the birthday bash details, fun challenges and prizes! You won't want to miss THIS party! The Places You'll Go stamp set is the 3rd stamp set in The Taylored Expressions Giving Tree Program designed to donate proceeds to a different charity each quarter. For each The Places You'll Go stamp set sold during September, October, November, Taylored Expressions will donate $7.00 to The Books for Kids Foundation. Note: This set is the same deeply etched rubber you have come to love! However, in order to cut down on manufacturing costs and donate more to charity, The Places You'll Go set will need to be trimmed when the customer receives it. I LOVE this cute rocket and that sentiment! How sweet is that? 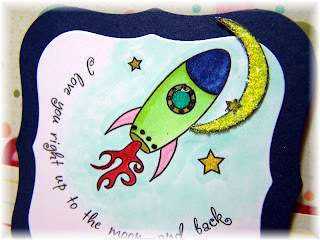 The rocket is extra sparkly thanks to my atyou Spica pens. The window in the rocket stands up because it's covered with Glossy Accents. The moon is totally covered with Lemon Drop Crafty Sparkles. The designer paper is from Imaginisce, Teacher's Pet line. You can't see in the photo, but all those little circles are embossed. The brads are from 7 Gypsies. 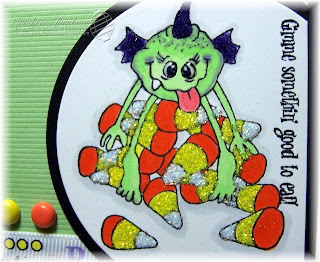 The main image is cut out with my Labels One Nesties and raised up on Jody's Foam Dots. Want to see more of this GREAT set that also helps a wonderful charity? Check it out! Enjoy the weekend! Hope you can join us over at the TE birthday bash! Hello Stampers! Sorry I haven't posted all week. All I can say is TGIF and how the heck did it get to be Friday SO fast? OCL is getting ready for Scrapfest at Mall of America later this month. We are all running in a million directions! So, if you are going, I'm looking forward (and prepping up a storm) to see you in a few weeks! I'm also trying to get all four kids ready to start school soon, so I'm not going to be around much next week either. I'll do my best to pop in... I have a feeling September is going to be CRAZY! I added our Rockstar Red Sparkles to the lips, and Perfect Pearls to the teeth. I cut out the drops of blood, added some Red Spica, then covered the entire drops with Glossy Accents. Touchable blood baby! Check out the sketch team! I can't wait to see what they did this week with the sketch. Have a fun holiday weekend! Be safe!